I think the following, taken with my recent blog on illegitimacy, offers some insight into the mindset of the upper classes. So many rules didn’t apply to them—which helps explain the behavior we’ve blogged about here, here, here, and here, and elsewhere. THE PRIVILEGES OF THE PEERS OF THE UNITED KINGDOM OF GREAT BRITAIN AND IRELAND. 1. That they are free from all arrests for debts, as being the king's hereditary counsellors. Therefore a peer cannot be outlawed in any civil action, and no attachment lies against his person. This privilege extended also to their domestic servants, as well as to those of members of the lower house, till the year 1770 . . . For the same reason they are free from attending courts leet, or sheriffs turns; or, in cases of riot, from attending the posse comitatus. 2. In criminal causes they are only tried by their peers, who give their verdict, not upon oath, as other juries, but only upon their honour; and then a court is erected on purpose in the middle of Westminster Hall, at the king’s charge, which is pulled down when their trials are over. 3. 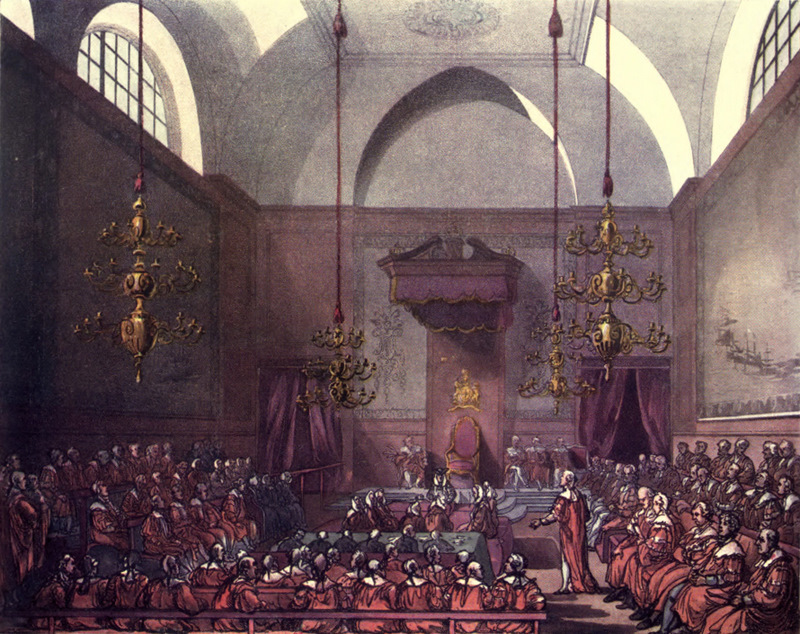 To secure the honour of, and prevent the spreading of any scandal upon peers, or any great officer of the realm, by reports, there is an express law, called scandalum magnatum, by which any man convicted of making a scandalous report against a peer of the realm (though true) is condemned to an arbitrary fine, and to remain in custody till the same be paid. 4. Upon any great trial in a court of justice, a peer may come into the court, and sit there uncovered. No peer can be covered in the royal presence without permission for that purpose, except the lord baron of Kinsale, of his majesty's kingdom of Ireland. See De Courcy, Baron Kinsale, in the Peerage of Ireland... In case of the poll-tax, the peers bear the greater share of the burden, they being taxed every one according to his degree. Wow, there's a situation ripe for expolitation! That's why it's so easy for them to be villians in our books! No wonder my dirt poor ancestors set sail for the New World. I have tried responding twice and each time the comment hasn't gone through. I was using a Google account but the place to sign in to Google never showed up. The comment screen was narrow and hard to read. I disagree with the others and feel that the peers had few privileges except the right to sit in the house of Lords. The other privileges don't amount to anything, MPs had the same privilege from arrrest during parliament and 40 days before and after. The men acting badly didn't come from privileges of law but from a belief that they were above the law, like today's politicians, movie stars, athletes, and others who are always reported in the tabloids. There must be a lot of stories that can be based on these rules & declarations. Showing my ignorance here, but what does "and sit there uncovered." mean? Lori, it means he sits there bareheaded, i.e., not wearing his hat...which is a little puzzling, isn't it? One assumes that men took their hats off in courtrooms, and indeed, this is the case in all the Rowlandson paintings of courtroom scenes in the Microcosm (from which my illustration is taken). But I've come across this before--something about peers standing uncovered while members of the House of Commons sat wearing their hats. Will have to dig more deeply, it seems.